With a name like InsuranceLeads.com, it is easy to understand why this company is able to attract attract a sizable audience of lead buyers. A large selection of product lines, combined with geography and risk filters equate to a solid combination for the company. 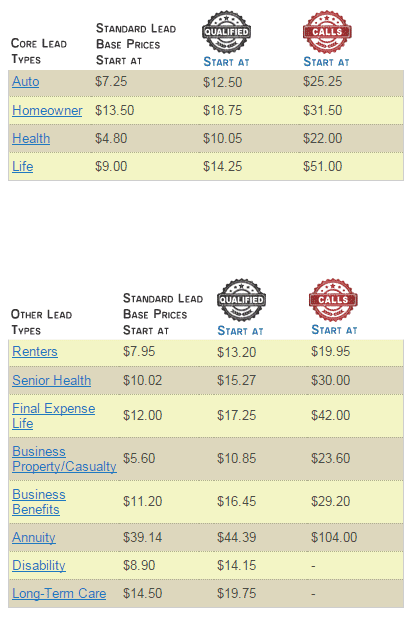 In addition to the use of filters, InsuranceLeads.com offers the ability to purchase leads based on predefined categories. For example, auto insurance leads are offered by the following types: custom auto, premium plus auto, premium auto, preferred auto, specialty auto, standard plus auto, standard auto, and juvenile auto. With carrier exclusive leads that are sold to between two and four insurance agents on average, competition is kept to a minimum. Custom options with InsuranceLeads are premium offerings that allow buyers upgrade and eliminate some or all of the upfront time requirements with real-time leads. Some examples include Qualified Prospect Leads and Calls. Qualified prospects are pre-verified via phone to ensure the shopper is interested in a quote and would like to talk to an agent. Calls take the verification process even further by initiating a live transfer to the buyer offering an exclusive lead with a 100% contact rate. Note: Pricing subject to change. I’m interested in weekend leads. Do you have access to these? I have questions about life and annuity for the younger advisors in my group, I am very unfamiliar with this market so I have some questions. Thanks for the comment Ryan. IL is one of the better options for online Annuity leads. To address the specific needs of your team your best bet would be to give them a call. We would like to expand out group health business targeting groups 10 to 20, using live leads via telephone transfer. Do you provide this service for South East Florida? If you do how much do you charge per lead? They do offer live transfer on all lead types. You’ll need to get in touch with them for pricing based on your needs. Thanks! How much time should I set aside for p&c leads and how many leads is considered “workable” per day? What is the average ratio of Leads to sales? I need to lock in my contract within 14 weeks or sooner with my company so I can move up to permanent full time status. I am interested in getting leads but am skeptical of buying them over the internet bc of the quality and distribution to other agents. I am looking to start small and as long as I am able to get a response I will increase the volume, I am interested in T-65 leads. I am a small agency just getting started. I want to get a few leads a week can I set limits on how many leads a week or a month I want? Hi Dave. Sorry for the late reply. Your comment was caught in the filter. This is going to depend on how much time you can set aside for working leads and responding quickly. I’d suggest starting as slow as possible and getting a good feel for the process before ramping up. The volume will vary by agency and more importantly by line and ZIP. Kevin – please email me – I want to ask about Juvenile Auto leads. Rates. I am an agent with Bankers Life and Casualty, I would like to know more about the leads you provide and find out how effective they are and how many agents in my area will have the same leads.